We consider a state-dependent multiaccess channel (MAC) with state noncausally known to some encoders. For simplicity of exposition, we focus on a two-encoder model in which one of the encoders has noncausal access to the channel state. The results can in principle be extended to any number of encoders with a subset of them being informed. We derive an inner bound for the capacity region in the general discrete memoryless case and specialize to a binary noiseless case. In binary noiseless case, we compare the inner bounds with trivial outer bounds obtained by providing the channel state to the decoder. In the case of maximum entropy channel state, we obtain the capacity region for binary noiseless MAC with one informed encoder. For a Gaussian state-dependent MAC with one encoder being informed of the channel state, we present an inner bound by applying a slightly generalized dirty paper coding (GDPC) at the informed encoder and a trivial outer bound by providing channel state to the decoder also. In particular, if the channel input is negatively correlated with the channel state in the random coding distribution, then GDPC can be interpreted as partial state cancellation followed by standard dirty paper coding. The uninformed encoders benefit from the state cancellation in terms of achievable rates, however, it seems that GDPC cannot completely eliminate the effect of the channel state on the achievable rate region, in contrast to the case of all encoders being informed. In the case of infinite state variance, we provide an inner bound and also provide a nontrivial outer bound for this case which is better than the trivial outer bound. We consider a state-dependent multiaccess channel (MAC) with noiseless channel state noncausally known to only some, but not all, encoders. The simplest example of a communication system under investigation is shown in Figure 1, in which two encoders communicate to a single decoder through a state-dependent MAC controlled by the channel state . We assume that one of the encoders has noncausal access to the noiseless channel state. The results can in principle be extended to any number of encoders with a subset of them being informed of the noiseless channel state. The informed encoder and the uninformed encoder want to send messages and , respectively, to the decoder in channel uses. The informed encoder, provided with both and the channel state , generates the codeword . The uninformed encoder, provided only with , generates the codeword . The decoder, upon receiving the channel output , estimates both messages and from . In this paper, our goal is to study the capacity region of this model. State-dependent multiaccess channel with channel state noncausally known to one encoder. State-dependent channel models with state available at the encoder can be used to model IE [1–4]. Information embedding (IE) is a recent area of digital media research with many applications, including: passive and active copyright protection (digital watermarking); embedding important control, descriptive, or reference information into a given signal; and covert communications . IE enables encoding a message into a host signal (digital image, audio, video) such that it is perceptually and statistically undetectable. Given the various applications and advantages of IE, it is important to study fundamental performance limits of these schemes. The information theory community has been studying performance limits of such models in which random parameters capture fading in a wireless environment, interference from other users , or the host sequence in IE and date hiding applications [1–4, 7]. The state-dependent models with channel state available at the encoders can also be used to model communication systems with cognitive radios. Because of growing demand for bandwidth in wireless systems, some secondary users with cognitive capabilities are introduced into an existing primary communication system to use the frequency spectrum more efficiently . These cognitive devices are supposed to be capable of obtaining knowledge about the primary communication that takes place in the channel and adapt their coding schemes to remove the effect of interference caused by the primary communication systems to increase spectral efficiency. The state in such models can be viewed as the signal of the primary communication that takes place in the same channel, and the informed encoders can be viewed as cognitive users. The model considered in the paper can be viewed as a secondary multiaccess communication system with some cognitive and noncognitive users introduced into the existing primary communication system. The cognitive users are capable of noncausally obtaining the channel state or the signal of the primary communication system. In this paper, we are interested in studying the achievable rates of the secondary multiaccess communication system with some cognitive users. Joint design of the primary and the secondary networks is studied in [9, 10]. The study of state-dependent models or channels with random parameters, primarily for single-user channels, is initiated with Shannon himself. Shannon studies the single-user discrete memoryless (DM) channels with causal channel state at the encoder . Here, , , and are the channel input, output, and state, respectively. Salehi studies the capacity of these models when different noisy observations of the channel state are causally known to the encoder and the decoder . Caire and Shamai extend the results of  to channels with memory . where is an auxiliary random variable, and is a deterministic function of . Single-user DM channels with two state components, one component noncausally known to the encoder and another component known to the decoder, are studied in . In terms of the capacity, the result (2) indicates that noncausal state at the encoder is equivalent to state at the decoder or no state in the channel. 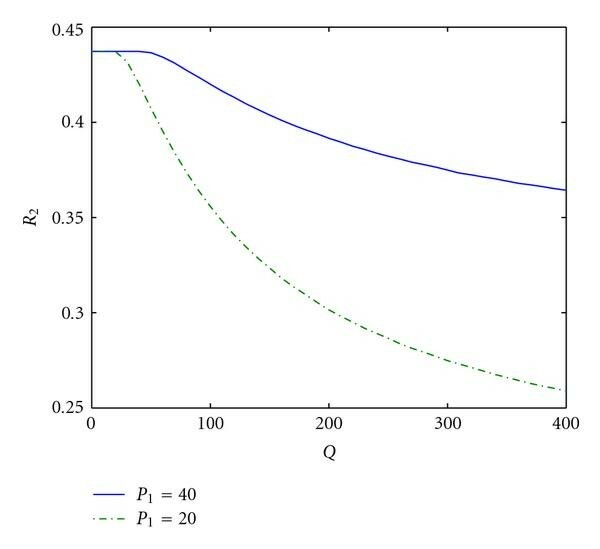 The so-called dirty paper coding (DPC) scheme used to achieve capacity (2) suggests that allocating power for explicit state cancellation is not optimal, that is, the channel input is uncorrelated with the channel state in the random coding distribution . As in the single-user Gaussian model, the capacity region (3) indicates that the channel state has no effect on the capacity region if it is noncausally known to both the encoders. Similar to the single-user additive Gaussian models with channel state, DPC at both the encoders achieves (3) and explicit state cancellation is not optimal in terms of the capacity region. It is interesting to study the capacity region for the Gaussian MAC with noncausal channel state at one encoder because DPC cannot be applied at the uninformed encoder. For the DM case, the state-dependent MAC with state at one encoder is considered in [21–23] when the informed encoder knows the message of the uninformed encoder. For the Gaussian case in the same scenario, the capacity region is obtained in [22, 24] by deriving nontrivial outer bounds. It is shown that the generalized dirty paper coding (GDPC) achieves the capacity region. The model considered in this paper from the view of lattice coding is also considered in . Cemal and Steinberg study the state-dependent MAC in which rate-constrained state is known to the encoders and full state is known to the decoder . State-dependent broadcast channels with state available at the encoder have also been studied in the DM case [27, 28] and the Gaussian case . We derive an inner bound for the model shown in Figure 1 for the DM case and then specialize to a binary noiseless case. General outer bounds for these models have been obtained in , however, at present, these bounds do not coincide with our inner bounds and are not computable due to lack of bounds on the cardinalities of the auxiliary random variables. In binary noiseless case, the informed encoder uses a slightly generalized binary DPC, in which the random coding distribution has channel input random variable correlated to the channel state. If the binary channel state is a Bernoulli random variable with , we compare the inner bound with a trivial outer bound obtained by providing the channel state to the decoder, and the bounds do not meet. If , we obtain the capacity region by deriving a nontrivial outer bound. We also derive an inner bound for an additive white Gaussian state-dependent MAC similar to [19, 20], but in the asymmetric case in which one of the encoders has noncausal access to the state. For the inner bound, the informed encoder uses a generalized dirty paper coding (GDPC) scheme in which the random coding distribution exhibits arbitrary correlation between the channel input from the informed encoder and the channel state. The inner bound using GDPC is compared with a trivial outer bound obtained by providing channel state to the decoder. 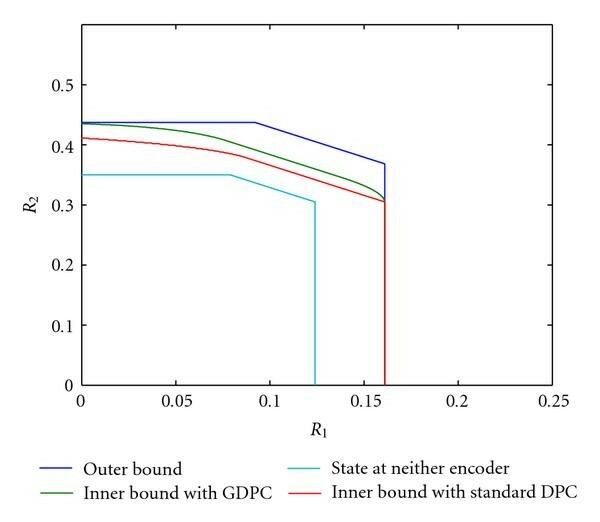 If the channel input from the informed encoder is negatively correlated with the channel state, then GDPC can be interpreted as partial state cancellation followed by standard dirty paper coding. We observe that, in terms of achievable rate region, the informed encoder with GDPC can assist the uninformed encoders. However, in contrast to the case of channel state available at all the encoders [19, 20], it appears that GDPC cannot completely eliminate the effect of the channel state on the capacity region for the Gaussian case. We also study the Gaussian case if the channel state has asymptotically large variance , that is, . Interestingly, the uninformed encoders can benefit from the informed encoder's actions. In contrast to the case of in which the informed encoder uses GDPC, we show that the standard DPC is sufficient to help the uninformed encoder as . In this latter case, explicit state cancellation is not useful because it is impossible to explicitly cancel the channel state using the finite power of the informed encoder. We organize the rest of the paper as follows. In Section 2, we define some notation and the capacity region. In Section 3, we study a general inner bound for the capacity region of the model in Figure 1 for a DM MAC and also specialize to a binary noiseless case. In this section, we also derive the capacity region of the binary noiseless MAC with maximum entropy channel state. 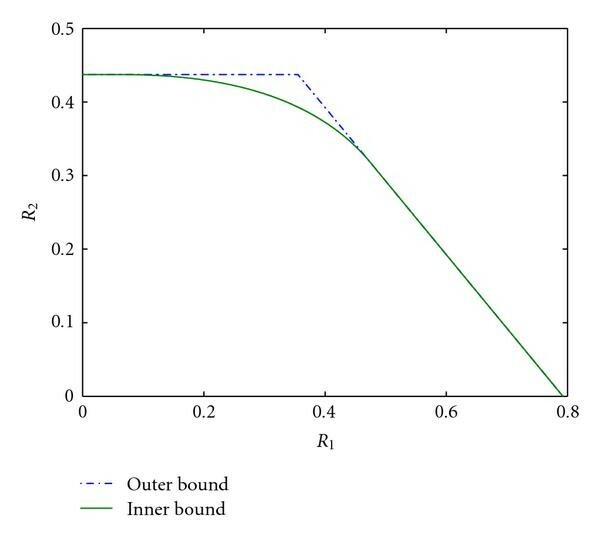 In Section 4, we study inner and outer bounds on the capacity region of the model in Figure 1 for a memoryless Gaussian state-dependent MAC and also study the inner and outer bounds for the capacity region of this model in the case of large channel state variance. Section 5 concludes the paper. Throughout the paper, the notation is used to denote the realization of the random variable . The notation represents the sequence and the notation represents the sequence . Calligraphic letters are used to denote the random variable's alphabet, for example, . The notation and denote the closure operation and convex hull operation on set , respectively. We consider a memoryless state-dependent MAC, denoted , whose output is controlled by the channel input pair and along with the channel state . These alphabets are discrete sets and the set of real numbers for the discrete case and the Gaussian case, respectively. We assume that at any time instant is identically independently drawn (i.i.d.) according to a probability law . As shown in Figure 1, the state-dependent MAC is embedded in some environment in which channel state is noncausally known to one encoder. respectively, at the beginning of each block of channel uses. We assume that the messages are independent and the probability of each pair of messages is given by . The capacity region is the closure of the set of achievable rate pairs . where and are auxiliary random variables. 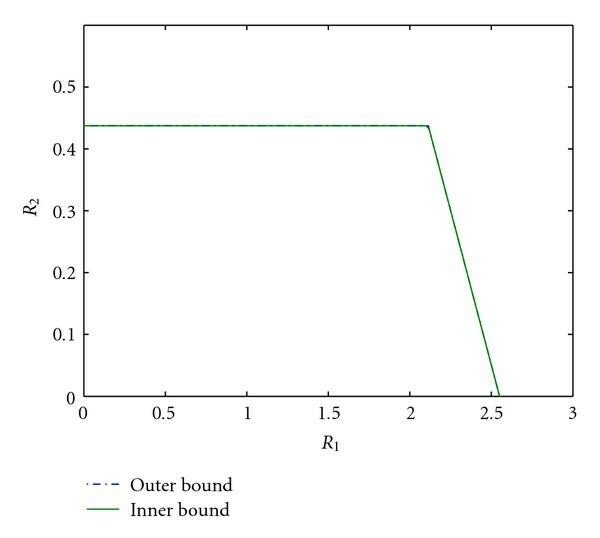 In this section, we derive an inner bound for the capacity region of the model shown in Figure 1 for a general DM MAC and then specialize to a binary noiseless MAC. In this section, we consider , , , and to all be discrete and finite alphabets, and all probability distributions are to be interpreted as probability mass functions. The following theorem provides an inner bound for the DM case. for some random vector , where and are auxiliary random variables with and , respectively. Then the capacity region of the DM MAC with one informed encoder satisfies . The above inner bound can be proved by essentially combining random channel coding for the DM MAC  and random channel coding with noncausal state at the encoders . For completeness, a proof using joint decoding is given in Appendix A.1. The inner bound of Theorem 1 can be obtained by applying Gel'fand-Pinsker coding  at the informed encoder. At the uninformed encoder, the codebook is generated in the same way as for a regular DM MAC . The region in Theorem 1 is convex due to the auxiliary time-sharing random variable . The inner bound of Theorem 1 can also be obtained by time-sharing between two successive decoding schemes, that is, decoding one encoder's message first and using the decoded codeword and the channel output to decode the other encoder's message. On one hand, consider first decoding the message of the informed encoder. Following , if , we can decode the codeword of the informed encoder with arbitrarily low probability of error. Now, we use along with to decode . Under these conditions, if , then we can decode the message of the uninformed encoder with arbitrarily low probability of error. On the other hand, if we change the decoding order of the two messages, the constraints are and . By time-sharing between these two successive decoding schemes and taking the convex closure, we can obtain the inner bound of Theorem 1. In this section, we specialize Theorem 1 to a binary noiseless state-dependent MAC of the form where and are channel inputs with the number of binary ones in and less than or equal to , , and , , respectively; is the memoryless state vector whose elements are noncausally known to one encoder and are i.i.d. Bernoulli random variables, ; and represents modulo-2 addition. By symmetry, we assume that , , and . The following corollary gives an inner bound for the capacity region of the binary noiseless MAC by applying a slightly generalized binary DPC at the informed encoder in which the channel input and the channel state are correlated. The capacity region for the binary noiseless state-dependent MAC with one informed encoder satisfies . Encoding and decoding are similar to encoding and decoding explained for the general DM case above. The informed encoder uses generalized binary DPC in which the random coding distribution allows arbitrary correlation between the channel input from the informed encoder and the known state. We consider and , where is related to by and with and chosen such that . We compute the region defined in (1) using the probability mass function of and the auxiliary random variable for all , and deterministic to obtain the region in (9). We use deterministic to compute the region in the binary case because we explicitly take the convex hull of unions of the regions computed with distributions. This completes the proof. The following proposition provides a trivial outer bound for the capacity region of the binary noiseless MAC with one informed encoder. We do not provide a proof because this outer bound can be easily obtained if we provide the channel state to the decoder. Then the capacity region for the binary noiseless MAC with one informed encoder satisfies . Figure 2 depicts the inner bound using generalized binary DPC specified in Corollary 1 and the outer bound specified in Proposition 1 for the case in which , , and . Also shown for comparison are the following: an inner bound using binary DPC alone, or the generalized DPC with and ; and the inner bound for the capacity region of the case in which the state is known to neither the encoders nor the decoder. A numerical example of the binary noiseless multipleaccess channel with , , and . 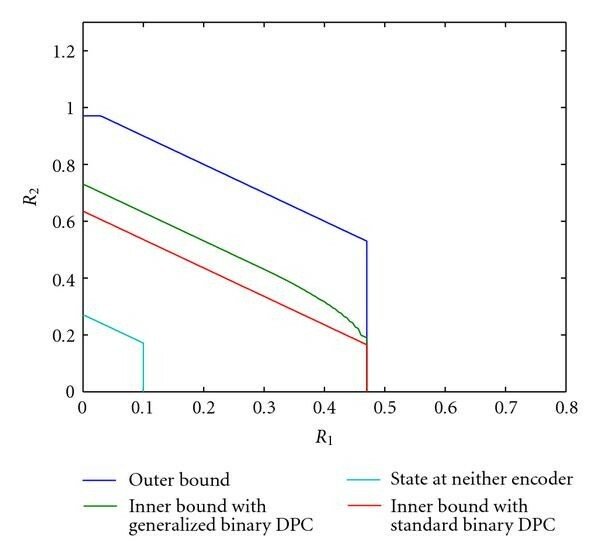 These results show that the inner bound obtained by generalized binary DPC is larger than that obtained using binary DPC , and suggest that the informed encoder can help the uninformed encoder using binary DPC  as well as generalized binary DPC. Even though state is known to only one encoder, both the encoders can benefit in terms of achievable rates compared to the case in which the channel state is unavailable at the encoders and the decoder. In this section, we discuss how the uninformed encoder benefits from the actions of the informed encoder even if so that . The following corollary provides the capacity region of the noiseless binary MAC with one informed encoder in this case. The region (2) is achieved if the informed encoder employs the generalized binary DPC with and or the standard binary DPC. We obtain (14) from (10) by substituting and in (10). A converse proof for the above capacity region is given in Appendix A.2. for . Since there is no binary noise present in for decoding , the message of the uninformed encoder can be decoded with arbitrarily low probability of error if for satisfying both and . If , we can achieve as if there were no state in the channel, though the maximum entropy binary state is present in the channel and the state is not known to the uninformed encoder. If , the uninformed encoder can still achieve positive rates, that is, . Let us now discuss how the informed encoder achieves rate below using successive decoding in the reverse order, that is, is decoded first using and then is decoded using and . If , can be decoded with arbitrary low probability of error if . This means that only is achievable. Then is achievable with and . Let us illustrate the case of maximum entropy binary state with numerical examples. 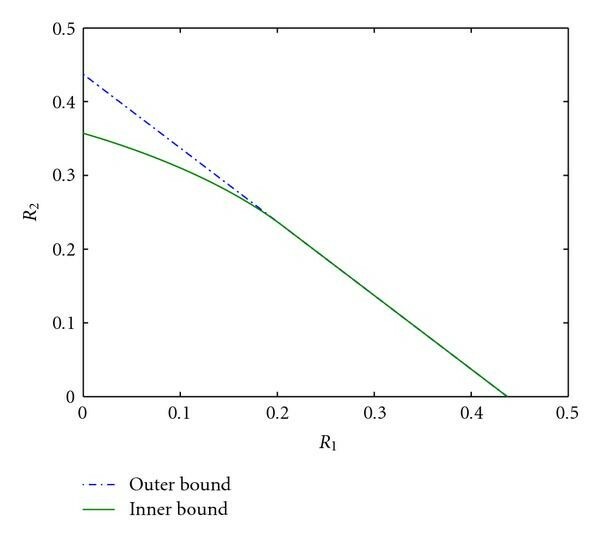 Figure 3 illustrates the inner bound given in Corollary 2 for and in two cases ( ) and ( ). In both cases, these numerical examples suggest that the uniformed encoder achieves positive rates from the actions of the informed encoder as discussed above. In the case of ( ), the informed encoder can still achieve though the channel state has high entropy and is not known to the uninformed encoder, and the informed encoder has input constraint . The capacity region of the binary noiseless MAC with maximum entropy binary state, that is, , and . In this section, we develop inner and outer bounds for the memoryless Gaussian case. The additive Gaussian MAC with one informed encoder is shown in Figure 4. The output of the channel is , where and are the channel inputs with average power constraints and with probability one, respectively; is the memoryless state vector whose elements are zero-mean Gaussian random variables with variance ; and is the memoryless additive noise vector whose elements are zero-mean Gaussian random variables with variance and independent of the channel inputs and the state. Gaussian state-dependent multiaccess channel with channel state noncausally known to one encoder. The following definition and theorem give an inner bound for the Gaussian MAC with one informed encoder. To obtain the inner bound for this case, we apply generalized dirty paper coding (GDPC) at the informed encoder. Our results for the DM MAC can readily be extended to memoryless channels with discrete time and continuous alphabets using standard techniques . The informed encoder uses GDPC in which the random coding distribution allows arbitrary correlation between the channel input from the informed encoder and the known channel state. Fix a correlation parameter . We then consider the auxiliary random variable , where is a real number whose range will be discussed later, and are correlated with correlation coefficient , , and . We consider . Encoding and decoding are performed similar to the proof of Theorem 1 in Section 3.1 In this case, we assume that is deterministic because time-sharing of regions with different distributions is accomplished by explicitly taking convex hull of union of regions with different distributions. We evaluate (9) using the jointly Gaussian distribution of random variables , , , , , and for a given and obtain . Also note that we restrict to for a given . By varying and , we obtain different achievable rate regions . Taking the union of regions obtained by varying and followed by taking the closure and the convex hull operations completes the proof. where , can be viewed as the remaining state after state cancellation using power , and is error with variance and is uncorrelated with . GDPC with negative correlation coefficient can be interpreted as standard DPC with power applied on the remaining state after state cancellation using power . In this paper, we focus on the two-encoder model in which one is informed and the other is uninformed, but the concepts can be extended to the model with any number of uninformed and informed encoders. The informed encoders apply GDPC to help the uninformed encoders. Following [19, 20], the informed encoders cannot be affected from the actions of the other informed encoders because the informed encoders can eliminate the effect of the remaining state on their transmission after the state cancellation by them. The following proposition gives a trivial outer bound for the capacity region of the Gaussian MAC with one informed encoder. We do not provide a proof because this bound is the capacity region of the additive white Gaussian MAC with all informed encoders [19, 20], the capacity region of the additive white Gaussian MAC with state known to only the decoder, and the capacity region of the additive white Gaussian MAC without state. Then the capacity region for the Gaussian MAC with one informed encoder satisfies . Figure 5 depicts the inner bound using GDPC given in Theorem 2 and the outer bound specified in Proposition 2 for the case in which , , , and . Also shown for comparison are the following: an inner bound using DPC alone, or GDPC with and as parameter; and the capacity region for the case in which the the state is unavailable at the encoders and the decoder. An achievable region for Gaussian MAC with , , , and . These results suggest that the informed encoder can help the uninformed encoder using DPC as well as GDPC. Even though the state is known only at one encoder, both the encoders benefit from this situation by allowing negative correlation between the channel input and the state at the informed encoder, since the negative correlation allows the informed encoder to partially cancel the state. The achievable rate region obtained by applying DPC  with as a parameter is always contained in in (20). In contrast to the case of state available to both the encoders [19, 20], GDPC is not sufficient to completely mitigate the effect of state on the capacity region. Figure 6 illustrates how the maximum rate of the uninformed encoder varies with the channel state variance if , for , and . 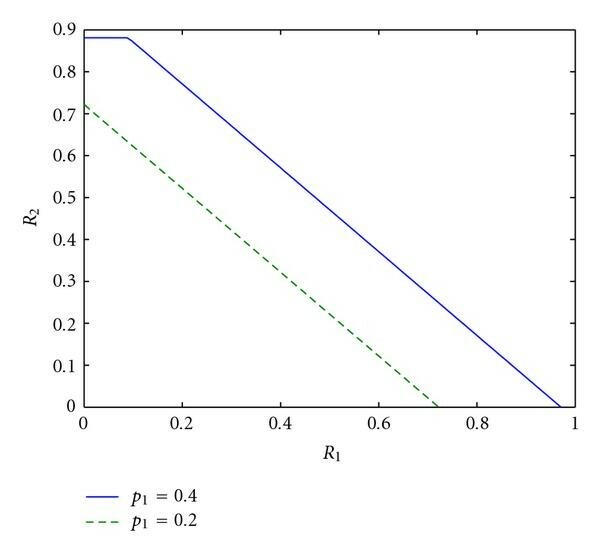 As shown in Figure 6, decreases as increases because the variance of remaining state also increases following state cancellation by the informed encoder. The decrease in is slower as increases because the informed encoder can help the uninformed encoder more in terms of achievable rates as its power increases. Variation of the maximum rate of uninformed encoder with the channel state variance when , , and . In this section, we discuss the inner bound in Theorem 2 as . where and . The right hand side of (25) is obtained by calculating the expression for the assumed jointly Gaussian distribution and letting . The channel output can be written as because for . The estimate of using is denoted as for . for . Since all random variables are identical, we omit the subscript for further discussion. The variance of total noise present in elements of for decoding is , where is the variance of , and is the error of estimating from . Then the message of the uninformed encoder can be decoded with arbitrarily low probability of error if for given and . Even if the variance of the state becomes infinite, nonzero rate for the uninformed encoder can be achieved because the estimation error is finite for due to the increase of the variance of with the increase of the state variance. is achievable. In this case, the uninformed encoder fully benefits from actions of the informed encoder, specifically from its auxiliary codewords, even though the variance of interfering state is very large. If , then is achievable, where . In either cases, GDPC with is optimal in terms of assisting the uninformed encoder, contrary to the case of finite state variance. This makes sense because if the state has infinite variance, then it is impossible for the informed encoder to explicitly cancel it with finite power. To investigate how the informed encoder achieves its maximum rate, let us consider successive decoding in the reverse order in which is decoded first using , and then is decoded using and . As , can be decoded with arbitrary low probability of error if . This means that only is achievable. Then is achievable with and . We do not provide a proof of the above proposition because the proof is similar to the converse proof given in Appendix A.2. The outer bound in Proposition 3 is better than the trivial outer bound in Proposition 2 obtained by giving the channel state to the decoder. Finally, let us discuss the case of strong additive Gaussian channel state, that is, , with numerical examples. Figures 7 and 8 illustrate the inner bound in Corollary 3 and the outer bound in Proposition 3 in two cases, ( ) and ( ), respectively, for and . In both cases, the uniformed encoder achieves positive rates from the actions of the informed encoder as discussed above. In the case of ( ), the informed encoder can still achieve , though the additive channel state is very strong and is not known to the uninformed encoder, and the informed encoder has finite power. The inner and outer bounds for the capacity region of the Gaussian MAC with one informed encoder in the strong additive Gaussian state case, that is, , for ( ), , and . As increases and , in the strong additive Gaussian state case, the inner bound in Corollary 3 and the outer bound in Proposition 3 meet asymptotically. Thus, we obtain the capacity region for and . For the very large values of , the outer bound given in Proposition 3 is achieved asymptotically with Figure 9 shows the inner bound in the strong additive state case which is also compared with the outer bound in Proposition 3 for the very large values of , that is, . The inner and outer bounds for the capacity region of the Gaussian MAC with one informed encoder in the strong additive Gaussian state case, that is, , for , , and . In this paper, we considered a state-dependent MAC with state known to some, but not all, encoders. We derived an inner bound for the DM case and specialized to a noiseless binary case using generalized binary DPC. If the channel state is a Bernoulli random variable with , we compared the inner bound in the binary case with a trivial outer bound obtained by providing the channel state to only the decoder. The inner bound obtained by generalized binary DPC does not meet the trivial outer bound for . For , we obtain the capacity region for binary noiseless case by deriving a nontrivial outer bound. For the Gaussian case, we also derived an inner bound using GDPC and an outer bound by providing the channel state to the decoder also. It appears that the uninformed encoder benefits from GDPC because explicit state cancellation is present in GDPC. In the case of strong Gaussian state, that is, the variance of state going to infinity, we also specialized the inner bound and analyzed how the uninformed encoder benefits from the auxiliary codewords of the informed encoder even in this case because explicit state cancellation is not helpful for this case. In the case of strong channel state, we also derived a nontrivial outer bound which is tighter than the trivial outer bound. These bounds asymptotically meet if and . From results in the special cases of both the binary case and the Gaussian case, we note that the inner bounds meet the nontrivial outer bounds. From the results and observations in this paper, we would like to conclude that we are not able to show that random coding techniques and inner bounds in this paper achieve the capacity region due to lack of nontrivial outer bounds in all cases for this problem. In this section, we construct a sequence of codes with as if satisfies (9). The random coding used in this section is a combination of Gel'fand-Pinsker coding  and coding for MAC . This random coding is not a new technique but it is included for completeness. Fix and take . The encoding strategy at the two encoders is as follows. Let , , and . At the informed encoder, where the state is available, generate sequences , whose elements are drawn i.i.d. with , for each time-sharing random sequence , where , and . Here, indexes bins and indexes sequences within a particular bin . For encoding, given state , time-sharing sequence and message , look in bin for a sequence , such that . Then, the informed encoder generates from according to probability law . At the uninformed encoder, sequences , whose elements are drawn i.i.d. with , are generated for each time-sharing sequence , where . The uninformed encoder chooses to send the message for a given time-sharing sequence and sends the codeword . Given the inputs and the state, the decoder receives according to conditional probability distribution . It is assumed that the time-sharing sequence is noncausally known to both the encoders and the decoder. The decoder, upon receiving the sequence , chooses a pair , , , and such that . If such a pair exists and is unique, the decoder declares that . Otherwise, the decoder declares an error. The first term, , and the second term, , in the right-hand side expression of (A.2) go to zero as by the strong asymptotic equipartition property (AEP) . Without loss of generality, we can assume that is sent, time-sharing sequence is , and state realization is . The probability of error is given by the conditional probability of error given , , and . where follows from the inequality . From (A.4), as . Under the event , we can also assume that a particular sequence in bin 1 is jointly strongly typical with . Thus, codewords corresponding to the pair and corresponding to are sent from the informed and the uninformed encoders, respectively. The Markov lemma  ensures jointly strong typicality of with high probability if is jointly strongly typical and is jointly strongly typical. We can conclude that as . From (A.7), as if and . From (A.9), as if . From (A.11), the as if . From (A.12), it can be easily seen that as . Therefore, the probability of error goes to zero as from (A.2) and completes the proof. In this section, we show that satisfies (14) for any given sequence of binary codes for the noiseless binary state-dependent MAC with and one informed encoder satisfying . follows from the fact that the binary entropy function is a monotone increasing function in the interval between and , and . Part of this work was published in Allerton Conference on Communications and Control, Monticello, Ill, USA, October 2004. This work has been supported in part by NSF grants CCF05-46618 and CNS06-26595, the Indiana 21st Century Fund, and a Graduate Fellowship from the Center for Applied Mathematics at the University of Notre Dame. This article is published under license to BioMed Central Ltd. This is an open access article distributed under the Creative Commons Attribution License, which permits unrestricted use, distribution, and reproduction in any medium, provided the original work is properly cited.